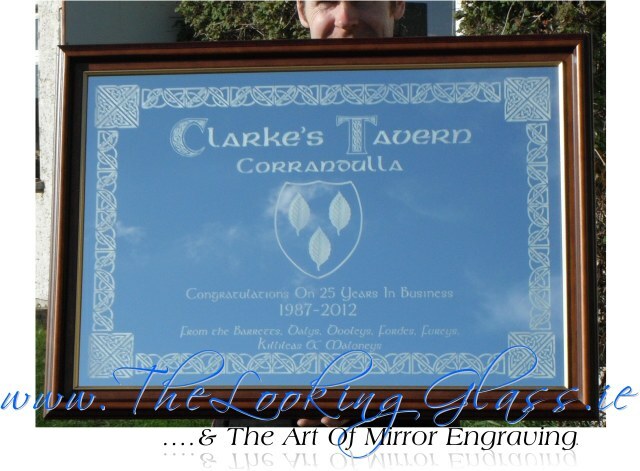 This was a gift ordered by Shelia in Corrandulla, County Galway, to celebrate Clarke’s Tavern 25th anniversary. To personalise this particular gift, Shelia requested that the names of local friends and customers be engraved in the mirror alongside the Clarke coat of arms ( family crest ), and that the entire design be celtic in theme. So using a combination of Irish fonts, we settled on this design which we trust will hang on the Clarke’s wall for another 25 years, when a 50th anniversary gift may be called for!!! Received the mirror this am. I’m delighted with it. Thank you very much. Going to deliver it today!